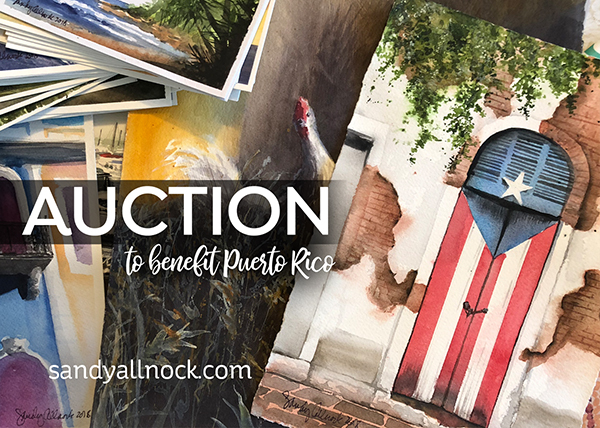 Puerto Rico Charity Auction – and planning for 2019 art retreat! I know, I know – it’s about time for this auction, right? Well, the 1 year anniversary of Hurricane Maria is coming up in a week, so I decided to host the auction while the anniversary is in the news. Do me a favor (or do Puerto Ricans a favor) when you see your friends and family see the reporting about the poor response to the need on the island, share the auction link with them. People will want to help! If you are wondering what you bid on and what your high price was that you set, click HERE and go to the “my auctions” link! Here’s a little happy preview…dance along! Watch the video below or click HERE to see it on YouTube. Did you see anything that’s a “must bid” out of the 70+ pieces??? Note that the thumbnails don’t show the whole painting. And there are a bunch (over 40!) that are postcards – so those who don’t have a lot to donate can still participate and help out. Auction closes September 30th at the end of the day – I think if you bid, you’ll get an email at the end reminding you that its closing. I hope! NOTE: If you bid OVER the listed amount by more than a buck, I think it puts the overage in ‘reserve’ – so for instance if on a $22 item you want to bid $25, it will mark it as $23 until someone else bids $24 then add you back in at $25. ALSO: For the large paintings, I’ll make a few of them available on Society 6 and those monies will go to the charities too – but it’ll only be the ones with the most individual bids on them. So even if you’re just nudging up someone else you might be helping to get a painting made available for prints, mugs, etc! I finally got in touch with the hotel to ask about setting up dates – and I know doing so this late may be too late for some. But…I’m going to try anyway, even if it’s a small group! First, know that I’m an artist not a trip planner. (LOL) So I’m making it up as I go, and am hoping everyone will have some grace! DATES: I haven’t set a date yet – because I need your feedback on date preference. I prefer going to a warm island while it’s rainy here, but in April prices drop a little. (See their website to know what prices are for a room you would want – they’ll give us a 10% discount.). Let me know in a comment if you prefer February or April. I’ll have your email addresses from comments and will email that list of people with updates. And let me know if you’re a for-sure or a maybe. ART: This is NOT a cardmaking or Copic retreat – it’s sketching. Why? Because I don’t want to go to such a lovely place and sit inside stamping and coloring! lol. We’ll go out and sketch – and if anyone wants to watercolor their sketches, that’s fine. Whatever medium is dandy. But I don’t want to do any finished works, because we could be out there for 4 or 5 hours trying to do one painting, but could do 4 or 5 sketches in that same time period. If you haven’t done plein air sketching as yet, no biggie – we’ll talk about what to get/bring before then. I strongly recommend taking Drawing 101 before the trip so you get the basics of perspective and light/shadow – we’ll be looking at things through the lens of that class. Do NOT worry if you aren’t great at drawing – that’s what we’ll be working on during the trip! ACCOMMODATIONS: We’ll be staying at The Gallery Inn. It’s a gorgeous place, and we’ll be doing some sketching/teaching sessions in the hotel, the rest on the streets of Old San Juan. LOCALS: PR residents will be able to come – and you can stay at the hotel or just meet up with us for sessions. If you haven’t seen the hotel, though, check it out – because it’s worth a weekend away! Let me know in your comment if you plan to stay at the hotel or not so I can chat with Jan about what we expect. Sandy, are you still doing the retreat? No, there wasn’t enough interest. 🙁 But I’m still going in January myself. You are so generous to do. this! Wow! What a cool place for an art retreat!! I’ve never been to Puerto Rico but it looks good from the view from the hotel. And what a view it is! Love all the nooks and rooms and, well, just everything about it! I can’t go, for health reasons, but I sure would love to. When the art retreat happens I want a video of everyone there! I want to thank you and all who bid, to help Puerto Rico. I’m from Puerto Rico, and my family lives there. I live in Maryland for 28 years. I’m so grateful for anything that can be done to help the people in Puerto Rico. A little bit goes a long way and believe they will appreciate it. About your trip to Puerto Rico, I think it’s best to travel in April, because in February a lot of flights get cancel due to bad weather coming or going. I will try to see if I can go. If there’s anything you need to know, please contact me via email. April will work better for me! Prefer April. Do you know how long the trip will be? I’m a maybe depending on details. I’m thinking Thursday thru Sunday but you can stay as long as you want. Your work is awesome Sandy, good luck with the auction! I am definitely interested depending on the duration you are thinking. Being from Minnesota, I slightly prefer a February date, but it still snows in April too. Just not available around April 5 +/- a couple of days.